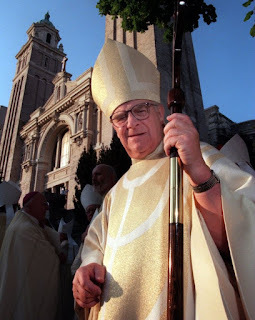 Yet again, it is the end of an era in the Stateside Church: on Sunday afternoon, Raymond Gerhardt Hunthausen – the US' last living Father of Vatican II, whose controversial tenure as archbishop of Seattle prefigured the hope and the strains of Francis-era Catholicism – died surrounded by his large, tight-knit family in his native Helena, a month short of his 97th birthday. Named bishop of the Montana church at 41 on the eve of the Council, by all accounts its four sessions saw Hunthausen undergo a "conversion experience." 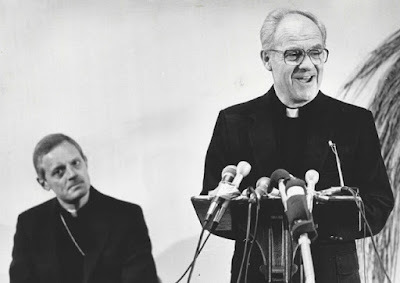 By the time he was sent to the Northwest's top post as Seattle began its own transformation into a cultural and tech hub, through the 1980s the Emerald City's second archbishop would come under the scrutiny of Rome and Washington alike, his respective advocacies for the church's marginalized and against the scourge of nuclear arms both running afoul of the prevailing winds of church and state. A first, searing glimpse of the polarization which would warp American Catholic life at large over the age to come, what became known as the "Hunthausen Wars" – two high-level Vatican inquests into the archbishop's ministry, capped by St John Paul II's 1986 imposition of an auxiliary bishop with special powers (whose own ferocious reception by the locals would see him relieved within a year) – remains an instructive moment in many ways. Yet even as the clamor took decades to fully subside – going well beyond the archbishop's early retirement at 70 in 1991 – it's long been said that for all the heat that ill-fated, 45 year-old assistant endured, the now-Cardinal Donald Wuerl left Seattle with Hunthausen as his one firm friend, a bond that continued into the present. A full obituary posted within minutes by the National Catholic Reporter, the piece contains a surprise – word of the coming release of a biography Hunthausen asked to be published only upon his death. Meantime, though the prelate known universally as "Dutch" has long been off the wider scene (choosing instead to immerse himself in hearing confessions), the sense of fresh life for his example was underscored earlier this year by the Pope's choice of Hunthausen's last vicar-general, George Thomas, as bishop of Las Vegas – itself a freshly booming outpost, now the West's largest diocese outside California. "Archbishop Raymond Hunthausen will be remembered in the public eye as a vocal pacifist, a compassionate pastor, and a reluctant prophet of peace. In the 1980s, his strident criticism of the nuclear arms build up and his controversial decision to withhold half of his federal taxes catapulted him into the limelight in the highly militarized Pacific Northwest. Ever uncomfortable on the world stage, Archbishop Hunthausen was personally pained by the controversies and criticisms that swirled around his vision and leadership. He took solace in his highly supportive family and found peace through an active and profound life of prayer. The “Dutch” I knew had a steel backbone, an implacable conscience, uncompromising tenacity, and a willingness to pay any price to follow the dictates of his conscience. Today his dream came true." 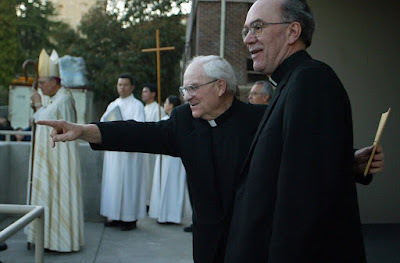 According to Whispers ops, Hunthausen's funeral will begin with a farewell in Helena – to which he returned upon his retirement – before a final return to Seattle, climaxing with his burial alongside his coadjutor and successor, Archbishop Thomas Murphy, beneath the sanctuary of St James Cathedral: one of the nation's most active diocesan hubs, itself a living legacy of a tenure whose impact has long, quietly endured, yet only now exists in its fullest light.